Your guinea pig requires a home that is safe and secure in order to keep him happy and healthy. A home includes a proper cage, the right bedding, hide areas, toys, and feeding supplies. Cavies are chewers, so wood and plastic cages are not suitable. They do like to tunnel in their bedding but do not dig. Wire mesh floors can cause serious injury to a guinea pig’s tiny feet and legs so the cage must have a solid bottom. Guinea pigs do better in pairs as they prefer company, so unless you have a lot of personal time to devote to your pet you might want to consider having two pigs. There are many commercially available cages that can make a wonderful home for your pets. Since they chew, the cage should not be made of wood. It should also have a solid bottom since wire mesh floors can hurt a guinea pig’s feet. You need about 2 square feet per cavy in a cage, but bigger cages make a happier pet. Keep your pig’s cage in an area where the temperature does not get too hot or too cold. At temperatures above 75 degrees, a guinea pig could die of heatstroke. Keep the cage well ventilated but not drafty. 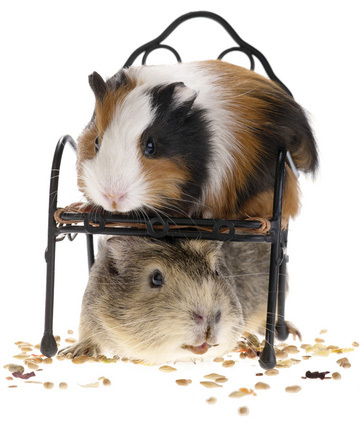 Since cavies are more active during the daytime, place the cage in a well lit area. There are many pelleted and shredded paper substrates that make excellent bedding and are commercially available. Wood shavings are not recommended since guinea pigs may chew on the bedding which can lead to serious health problems. Some wood shavings also have sharp particles and can be abrasive to sensitive feet or get into the cavy’s eyes causing injury. Guinea pigs drink a lot of water. Not only do they drink it but they also play in it and love sitting in a water bowl. So if you use a bowl the dirty water must be changed more than once a day. A stoppered water bottle is a good alternative. The bottle should have a metal tube so your pet won’t chew it. These animals love to eat, but feeding them can sometimes be a challenge since they will often play in their food bowl. There are many different types and styles of food bowls available. A bowl that is difficult to spill or can be attached to the side of a cage will keep messes to a minimum. Every cage should include at least one hide area per cavy. These hideaways reduce stress and provide your pet with a safe and quiet place to rest. You can use a commercially available hide or something as simple as a flower pot or a large PVC tube. Guinea pigs are playful animals, but not really interested in exercise. They do love to nibble and chew so unpainted and untreated wood chew sticks are a must. A variety of toys that they can climb over, push around or chew will keep your pets happy and entertained. One toy you do not want to get is an exercise wheel. Wheels are bad for a guinea pig’s spine and could cause injury. You pets’ cage will most likely need cleaned at least once a week. Guinea pigs are clean animals and dislike a dirty cage. Replace the bedding, wash the water bottle, food dish, toys, and any other areas that may smell with soapy water. Be sure to dry everything before placing stuff back in the cage.